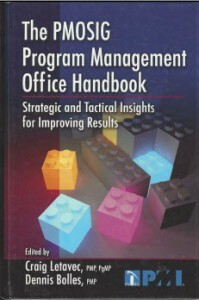 The PMI(R) Program Management Office Specific Interest Group (PMOSIG), consistent with the vision to be the leading professional community providing innovation and thought leadership in the area of the PMO and related subjects, created this book (2010, JRoss Publishing) to achieve its mission to return direct value to the PMO community. This book contains chapters submitted by more than 20 notable authors, subject mater experts, experienced practirioners, and thought leaders with a variety of backgrounds and experiences. These contributions provide insight into practices that successful PMOs have employed to return direct value to the organizations that they serve. PMO Governance – Covers roles in organizational governance, portfolio management, and organizational change management. PMO Strategic and Tactical aspects – Includes examples of how PMOs have participated in strategic and tactical management, as well as in the management of programs and projects, to achieve business benefits. PMO Services – Covers the development and management of governance policies and procedures, standards, methodologies and processes, education and training programs, tools and templates, PMO technical systems, and prorgam manager, project manager and portfolio manager assignments. PMO Setup and Execution – Includes best practices and case sturies for sucessfully aligning new PMOs with business objectives, delivering benefits and ROI, and managing and expanding the PMOs scope of service. PMO Performance and Maturity – Describes the processes used to drive excellence that enhances the PMOs long-term sustainability as a business function. It is the hope of the PMOSIG that this book provides content that will help readers to embrace their PMO, whether just starting out as part of the ongoing process of delivering additonal value through the PMO. It is exciting to see how the contributions to this book vary even with something as simple as a description of what a PMO really is. The varisty of techniques and approaches presented for PMO setup establishing and maintaining sponsorship, expanding PMO services, and Maturing the PMO demonstrate that a lot has been learned since the PMO concept was initially established and that we agree that flexibility is one key to success as no two PMOs will be exactly alike. We are still a long way from a common understanding of the PMO and its role in the project and organizational context, but clarity is starting to emerge regarding the factors that are likely to lead to PMO sucess — reflected on in numerous places within this book. The Authors/book Editors welcome the opportunity to help further drive the PMO community forward, and hopes that this book is another step toward enhancing knowledge in PMO therory and practice. Whether you're just starting a new PMO, focused on re-establishing a PMO in your company, or have a successful PMO that is expanding its scope of services, you are on an exciting journey. Let the experience of the contributors to this book help be your guide.